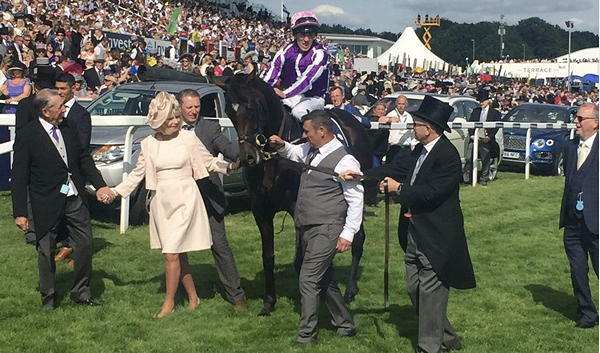 WINGS OF EAGLES WINS THE EPSOM DERBY! Padraig Beggy made his first ride in the G1 Investec Derby a winning one aboard 40/1 shot Wings Of Eagles to provide trainer Aidan O'Brien with his sixth victory in the 12-furlong Premier Classic and Britain's richest race. Held up early on, the three-year-old son of Pour Moi, the 2011 victor, siring his first Derby winner, made steady headway in the home straight and collared stable companion Cliffs Of Moher, ridden by Ryan Moore, late on with a powerful surge to score by three-quarters of a length. The well-backed 7/2 favourite Cracksman, trained by John Gosden was a neck behind Cliffs Of Moher in third, with a further three-quarter lengths back to Martyn Meade's Eminent in fourth. An eye-catching second in the Chester Vase last time, Wings Of Eagles looked capable of further progression and the master of Ballydoyle was quick to praise the horse and Beggy's masterful ride aboard the colt. 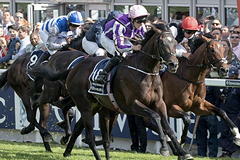 O'Brien said in the press conference after the race: "Padraig gave the horse a brilliant ride. He saw him in all his work as Padraig rides work with Donnacha, they are partners so they would have seen all the work Wings Of Eagles did even if he didn't ride him every day. "Last year, we thought he was a nice horse and Seamus [Heffernan, jockey], who rode him in the Chester Vase and was delighted with him. He is a horse who travels well and quickens well. We were very happy with all the horses coming into the race. "Padraig is a world-class rider. He has been with us a good while now and we really appreciate his work day in, day out every morning and obviously when we discussed what jockeys were riding in the Investec Derby, there was no question that Padraig wouldn't ride." O'Brien also praised the performance of Cliffs Of Moher who also made up good ground in the straight to give the trainer a 1-2 in the Classic. He continued: "With Ryan's horse [Cliffs Of Moher], we were just slightly worried that he was a bit of a baby and he just tired in the last 50 yards, but Padraig gave Wings Of Eagles a great ride - we were delighted. "When Ryan was getting to the front, we could see Padraig was staying and we thought his horse would get a bit further than a mile and a half." 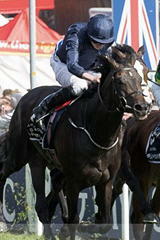 Winning rider Padraig Beggy, was understandably delighted to win the Investec Derby on his very first ride in the race. He commented: "They go very quick in the Derby all the way from the start and I ended up behind Ryan [on board Cliffs Of Moher, second] so I was happy enough but I was a little bit further back than I wanted to be. "The main thing was that my horse was in a rhythm and he wasn't pulling or keen. He settled really well so the first part of the race went really well for me even though I was in a bad position as such. We talked through the race and Aidan said to keep him balanced down the hill so I was more squeezing him rather than asking him to go. "I was waiting for Ryan to get a split so I knew that when Ryan got a split, I could go with him. I knew I was going to pass most of the field but I didn't think I was going to pass them all like I did but I knew I was going to finish. Two furlongs out, I thought I was in with a chance, one furlong down, I knew I was going to win because of the momentum I had picked up and got. I won a shade cosily in the end but look it was a great feeling and up the straight, you are passing horses at a lot of speed so it was great. "About two furlongs out, I saw Ryan going for a gap and I was going to go with him, but then a gap opened nearly directly in front of me and he went through it too quickly, that was how well the horse was going, so it took me three or four strides to get him out. I find another gear the last furlong and a half, the further we went up the straight I knew I was going to win." Asked about his past, Beggy said: "I started off riding in Ireland then went and rode in the North of England for a little while and then I was down South for a fair bit in Australia. 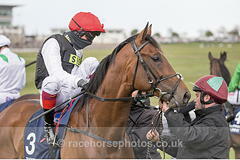 I then came back home and got the job in Ballydoyle and I've put in a fair bit of work and I've got a reward like this. I rode Hydrangea [also trained by O'Brien] to victory in a 1000 Guineas Trial earlier in the year and she was a very creditable third in the Irish 1000 Guineas so she was probably my biggest race to date. I've won plenty of handicaps but I have never really had Group wins before Hydrangea and obviously today." Beggy tested positive for cocaine whilst riding in Australia and served a one-year riding ban. However, he was delighted to have put that past misdemeanour behind him with today's victory. He continued: "I got into a little bit of trouble in Australia - it was a little mistake and look, I was knocked down and I had to come back fighting and I have proved that today so I am very happy. I gave a positive test for cocaine, I had to pick myself back up there and I had either had to get back riding there or come back to Ireland and I decided to come home as I had done well in Ireland, not in Pattern races, but I had done well. "I was in Australia and came home to work for Aidan in early January and I've been there every day since. You are riding the best horses day in day out and look, the likes of that colt [Wings Of Eagles], I would never get the leg up on a big strong, three-year-old colt like him without being at Ballydoyle, so I've won the Derby! I can't say much more. I got into Ballydoyle and Aidan had a chat with me and said if I keep working, that someday we will repay you and there you go! I don't think he meant the Derby! "I know I can ride a horse. I'm far from cocky but I'm confident. I wasn't worried about riding in the Derby one bit and it helps that I knew the horse I was getting on. Another person might have been shaking but I just wanted to get down to the start and get back underway as quick as possible. "I got my interest in racing from going to Fairyhouse when I was younger. My father used to take me and school wasn't my thing and he sent me to an apprentice school and I was apprenticed to Kevin Prendergast and had a lot of success. I worked very hard but you need to be with big trainers so I then went abroad to go travelling but I'm happy I came home now. "I knew I was riding a fine big colt who was coming here in good form. All six of those horses were trained by Aidan O'Brien for the Derby. It doesn't matter if one was 4/1 or 33/1, he has trained them to come here to run the race of my life. I won obviously and Ryan was second but you could run the race tomorrow and one of our others could win - they all had a great chance. "I was going out and my main thing was to get him to the start as he is a big strong boy. He did get relaxed as you walk the last furlong to the Derby start here so that helped to chill him out. "I'm sitting on a massive big colt and he was on his best behaviour just as we were about to enter the stalls. I wouldn't say I was confident but I knew I was going to run a big race. "It means the world to me. I've rode winners but not big Classic winners and I thought those type of horses had gone by me until Aidan started to give me these sort of rides." Beggy also paid tribute to Ballydoyle handler O'Brien. He remarked: "I've rode for a lot of trainers but Aidan looks at a horse in a different way to everybody else. He is there night, noon and morning, he looks at them head to toe. I don't know what makes him so good but I knew we had six horses coming here for one of the biggest races in the world and each one of them had a little chance. Another trainer doesn't have the calibre of horse and can't get one here - Aidan gets six here so that's maybe why he is good, I'm just happy mine was the best on the day. "Aidan is a marvellous man to train a horse and he is also a fair man you know. He was good to me once I got my licence back and Aidan and also Joseph [O'Brien, Aidan's son and fellow trainer], both started giving me rides straight away so I have a lot to owe to them." Derrick Smith, whose colours Wings Of Eagles carried to victory, remarked: "Ryan picked Cliffs Of Moher but all six horses went there with a big chance. They all finished close together in the trials and that was just the way it was. We couldn't really identify who was our second, third and fourth best; they all had an equal chance in our eyes. "He came from behind in the Chester Vase to finish second. That was a really nice run and he was the best horse on the day. It's great for Pour Moi to sire a Derby winner." Behind the Aidan O'Brien-trained one-two in the Investec Derby finished Cracksman in third, trained by John Gosden, and Eminent, a son of Frankel and trained by Martyn Meade. Both trainers were delighted with their horses, with Gosden feeling that Cracksman, who missed his prep run in the Dante due to fast ground, a little immature in running. "I think Frankie [Dettori] found that the horse was still a bit immature mentally about the whole thing," explained Gosden. "A couple of times, Frankie had to galvanise him, particularly at the top of the hill - you could see his elbows moving a little, it was even picked up by the commentator. "He was running a bit babyishly - maybe he could have done with that other race beforehand - but he has run a grand race, he was just caught out for experience and wasn't beaten far." Asked if the race panned out as expected, Gosden said: "We knew there was going to be a lot of pace, but the pacemakers were rather ignored, they were allowed to go and they took a bit of catching. "On the whole, it is the sort of result we expected with Cliffs Of Moher, Cracksman and a 40-1 shot trained by Aidan, which we thought could happen. "There are obviously a solid, even bunch of colts and we'd be happy for a rematch - Cracksman is in the Irish Derby and it wouldn't bother me going there at all, it is a nice galloping track and it would suit him." Of the rest of his runners, Gosden reported: "Pealer had a little trouble, he was holding on to his breath; Crowned Eagle wasn't happy coming down the hill and the other boy, Glencadam Glory, is a Leger sort. Overall, I am happy enough, and, in fact, they ran how I thought they would." Martyn Meade, trainer of the fourth-placed horse Eminent, said: "I think he was just squeezed out in the closing stages, and he didn't travel too well to start with - it took him a little time early on to get into his rhythm and to get into a position as they came around the top of the hill. "He had a lot of ground to make up, and that is his beauty really, when he came into the straight he could really use his stride. He was squeezed a little at the end and he wasn't beaten far, but he just wasn't the best on the day today. "I'd love to run the race again now, or at least next week! "Jim [Crowley] immediately got off him and said the Irish Derby - he certainly stays, I don't think there is any question about that. We just didn't get that bit of luck in running, it didn't really work out as we'd like today, but we are thrilled to bits with him - it is only his fourth run and we've lots of excitement to come, I hope. "I had no worries in the preliminaries today, he's a real professional. "A bit more cut in the ground would have been preferable too - the ground was perfect but for him as he'd have like a bit more cut."